Use profile incremental sync job doesn’t display schedule correctly | Are you a user? This is a bit of a weird one. 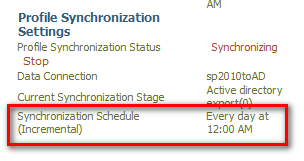 I had the user profile incremental synchronization job set hourly, but it never showed up as being scheduled. …and voilà! It now shows up as being set. Not sure I’m going to spend too much time on this one until after I upgrade to SP1. Hope this helps, and I hope M$ catches this in an update.